If there is a universal language, I’d like to think it’s the appreciation of good food. Asia is nothing if not famed for her abundance and diversity of flavours, sweet to sour, spicy to simple, noodles to rice. I love eating, and cooking has been a part of my life and a huge part of my career. I grew up surrounded by the familiar smells of spices, caramelizing meats, heat and the tinkling of crockeries. Naturally, that curiosity extended into discovering the map of flavours that represent Asia, and there’s no better way to start than in Southeast Asia. Smack dab in the middle of ancient maritime trade routes is Malaysia, and nothing speaks of the giant influence of a variety of ideas and that seeped into the flavour profile of the country. Nasi Lemak literally means Fatty Rice. A staple, it is white rice cooked with coconut milk (hence the name), served with a spicy savoury sambal, cucumbers, fried anchovies, peanuts and egg. It can also be served with spiced fried chicken, seafood or fish. Usually sold in palm sized pyramids made of banana leaves, Nasi Lemak is eaten for breakfast, lunch or dinner. It’s cheap, has all the basic ingredients of a full meal and most importantly, bloody delicious! The kingmaker in any Nasi Lemak will always be the Sambal, which must balance savoury, spicy and sweet that comes from being caramelized for long periods and the savoury undertones of belacan (shrimp paste). 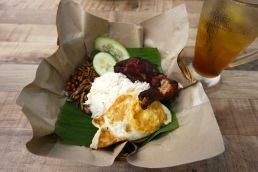 Found everywhere in Malaysia, the best Nasi Lemak can be found in Penang and Kuala Lumpur, although regional variants do exist. 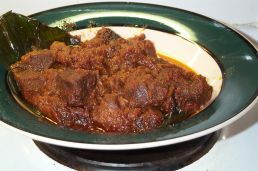 While Rendang can be found in Malaysia and Singapore, the ones in Indonesia showcase the greatest diversity in its usage and selection, much like curry in India. Rendang is a dry spicy meat, stewed along with a variety of spice depending on the region. It can be chicken, beef, mutton or duck and even vegetarian options like jackfruit. By stewing it for long hours, the meat becomes very tender it falls of the bones and absorbs the magnificent and complex fragrance of the spices. A very famous example of where you can find some of the best Rendang is in Padang. Nasi Padang, or Padang Rice is like a buffet of rendang served with rice that you can pick according to your liking and truly showcases some of the most varied examples of this method of cooking. The smell is hard to put in words but I’d say it’s a complex but beautiful marriage of coconut, fennel seed, onion, cardamom and pepper. Thailand, paradise for travelers worldwide, and also home to some of the spiciest food in the region. The word Tom Yum is well known worldwide, and nothing encapsulates the Thai experience like having a bowl of Tom Yum Kung along a busy street cooked fresh to order. This spicy and sour soup is a glorious combination of herbs and spices like kaffir lime leaves, lemongrass and galangal, spiked with a subtle amount of Nam Prik Pao. A quirk of the colonial era, Banh Mi has always struck me as a very interesting fusion of local and foreign ingredients in Vietnam. The French brought baguettes, and the local Vietnamese adapted it to suit local taste buds with the addition of Vietnamese produce. A baguette is sliced in half, and filled with a combination of meats, vegetables and condiments, making a sandwich. Popular fillings are roasted pork meat or cold cuts, cilantro, pickled radish and carrots as well as mayonnaise, chilli sauce and pate. The crusty baguette holds the rich fillings that is bursting with condiments, evoking sweet, salty and sour all in one bite. 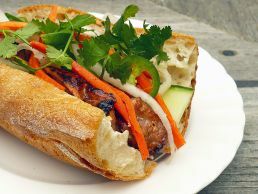 Banh Mi can be found from high end eateries to roadside vendors in Hanoi all the way to Ho Chi Minh. I remember the first time I took a bite of this Filipino dish. It left me confused, and like a young lover, quickly and madly in love. 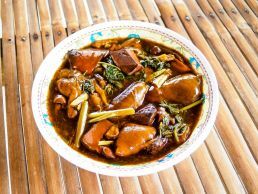 Kare Kare is a meat stew in thick peanut sauce, made with beef or pork, as well as other parts like oxtail, calves feet and even offal. The vegetables usually outnumber the meat, like eggplants, okra and green beans. The dish is stewed with onions and roasted peanuts. In some cases, peanut butter is used instead. Annatto adds a subtle hint of nuttiness and color. Kare Kare is normally eaten with Bagoong, a savoury shrimp paste, calamansi juice and rice. 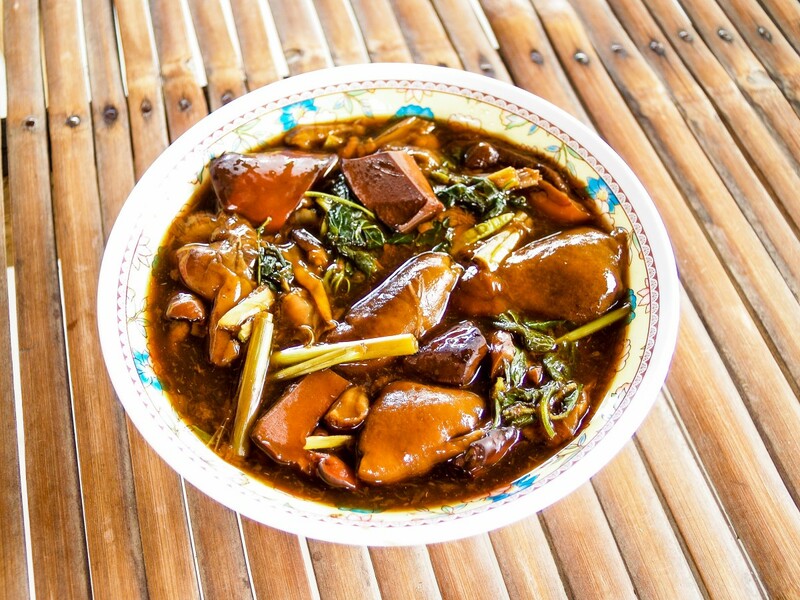 Manila and Pampanga has some of the best Kare Kare in the country. While Lechon and Adobo are more well known, I love the creamy nuttiness and savoury layers that come with this very simple dish. The national dish of Myanmar, Mohinga. A breakfast staple, Mohinga is a fish based soup served with rice noodles. Due to its ubiquity, every region has their variances and unique features, like less soup or different condiments. 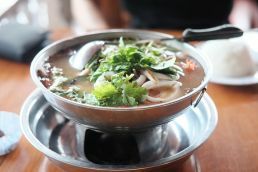 The scent of coriander leaves, lime and fried onions meld perfectly with the intense fish broth. I love the ones with egg and pe gyaw (split fried chickpeas) that lend a nice crunch to the flavourful lemongrass and ginger scented soup. 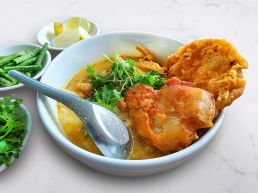 It’s easy to find Mohinga everywhere in Myanmar, from Yangon to Mandalay, and while it is commonly eaten for breakfast, many eateries now offer it all day, every day. This article is the first part of a series about food and traveling called A map of flavours, more stories to come soon.